Alphabetically speaking, Auburn is up first. And Auburn almost lost to Jacksonville State. Let me repeat that: Auburn almost lost to Jacksonville State. As in went to overtime. As in only had a chance because of a terrible punt. As in were down at halftime. As in tied the game with under a minute left. Against FCS Jacksonville State. Auburn was ranked 6th. Auburn had a shot at the playoffs. They dropped to 18. But hey, better than a loss I guess. Keeping alphabetical, BYU is on pace to have the most consecutive wins via late game Hail Marys. Two for two! Boise State probably lost all hopes of making the playoffs with an early loss and a schedule that doesn’t lend itself to voting. You can’t help but root for Tanner Mangum, whose two interceptions shouldn’t overshadow his 309 passing yards, or BYU’s 21 point fourth quarter for the win. Up next is a game at UCLA which I expect them to lose. But I’m hoping they make it 3 for 3. HAIL MARY! I’d say that Notre Dame gets the award for most disappointing victory, but if you go back two paragraphs, Auburn almost lost to Jacksonville State. So ND will have to settle for second. There were five lead changes including the game winning 40 yard touchdown pass with 12 seconds left; a huge play that came from backup QB DeShone Kizer, entering the game in the third after starter Malik Zaire suffered a season ending ankle injury. He’s the fifth starter to be ruled out for the season, but the replacements have shown up when they are needed and we know the Selection Committee likes a team overcoming adversity (see Ohio State, 2014). A big game against Georgia Tech this week, and I give them the edge at home. If only homefield advantage worked for the Volunteers, who get the award for most disappointing loss. According to the FPI metric that I don’t understand but that ESPN seems to like, Oklahoma had a 3% chance of winning in the third quarter. I’ll do the math for you on this next one: Tennessee had a 97% chance of winning. But they didn’t. The Sooners dug into their bag of Hunger Games references and found the odds ever in their favor. At least enough to shut the Vols out in the second half, score 14 in the fourth quarter and then win in double overtime. Big out of conference win for OU and a tough loss for a Tennessee team looking to turn things around in the SEC. Boomer Sooner. LSU had their first game of the season and won an important one at Mississippi State. Dak Prescott is definitely one of the best QBs in the SEC, if not the country as a whole. Leonard Fournette had 159 yards and all three LSU touchdowns in another game that was decided late. The Bulldogs had 13 unanswered points in the fourth, but missed a 52 yard field goal to win as time expired. The Tigers were able to avenge last year’s loss to State and are certainly one of the non-top 10 teams that have a good chance to make the playoffs. 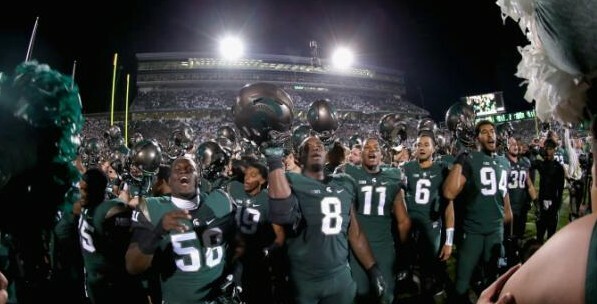 Lastly, Michigan State beat Oregon in the statement win of the week. Remember when I said they would win and move into the top 4? I do. I also remember getting every score not only wrong, but very wrong. So give me this one, OK? Thanks. Vernon Adams certainly has what it takes to replace Mariota in a strong offense, but they need to go undefeated in order to make it back to the playoffs. Connor Cook led the Spartans to an important win, setting them up for a major BIG10 clash against Ohio State in November. MSU looks complete and have an early, talent-proving win that other teams still need to find.